If you are a swede lover, I would love to know. I want to know what you love about swede and how you like to cook it. Please write in the comment section below. And if you are a swede hater, tell me what you hate about it and how you’ve tried it, too. I have been having a veg-box delivery every week now since the middle of January and one of the vegetables I’ve seen most of is swede. Since I made a pact that I would try to eat everything that arrives in the veg box, every swede I get is a fresh battle. The battle is to try to find something to like about it as swede is not a friend to my tastebuds. I’ve cooked my swede in different ways – in a root veg gratin, in mash and in an apple dish – but I still don’t like it. And it’s rare for me not to like a food. So, swede lovers, I challenge you to convert me! The gauntlet is down. Add Your Vote to My Swede Poll! The ancient symbol of a damned soul. 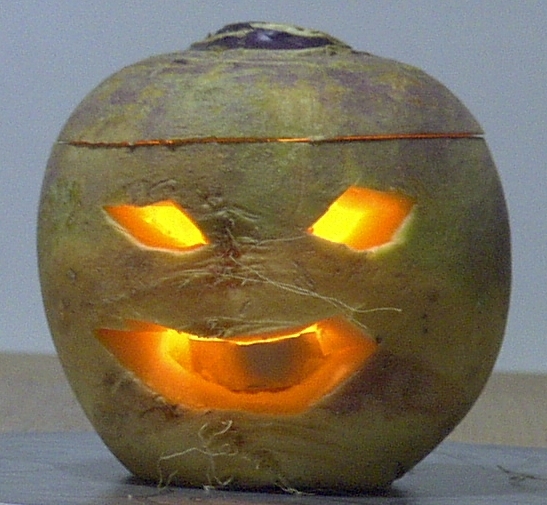 Turnip jack'o'lantern (couldn't find an image of a swede lantern). Image from Wikipedia. Oh my word . . . another week, another swede. In fact this week’s box is identical to last weeks with: • Sweetcorn • Potatoes • Cabbage • Onions • Mushrooms • Carrots • More sweeeeeeede! As it’s another small swede I will ‘face the fear and eat it anyway’ – some how, some way. May the force be with me. In the meantime, as painful as it is, I guess I should try to feel some love for ye olde swede-ee and explore it’s good side. So does the swede have any good things to offer? What Nutrients Are in Swede? According to the website Nutrition Data, swede is a very good source of vitamin C, potassium and manganese, and a good source of fibre, thiamin, vitamin B6, calcium, magnesium and phosphorus. With potassium, calcium and magnesium it has certainly got the electrolytes covered. Nutrition Data also rate this veg as good for weight loss, which I believe could be true due to the fact that once you’ve cooked it, you don’t want to eat it. Well . . . that’s how it works for me! What I can’t understand is that one website describes the flavour of swede thus: ‘this creamy, orange-fleshed vegetable has a wonderful nutty, sweet flavour’. Huh?! They are definitely not eating the same swede that I’m eating! I would describe swede as beige/yellow fleshed with a harsh, earthy/metallic flavour and weighty enough to sink a ship. I wonder if swede inspired the canon ball? OK, so at this point in my research, I’m not convinced of the swede’s good points. Then I discover that this vegetable carbuncle is also called a ‘rutabaga’, which is a much cooler name! Furthermore, before pumpkins were grown in the UK and Ireland, swede were carved with faces and used as Jack’o’lanterns on Halloween. In this form they were the ancient symbol of a damned soul. The ancient symbol of a damned soul . . . now that definitely fits with my experience of swede – they certainly taste like hell! Please vote in my swede poll – click here. Now, it seems to me that each week these swede fellas are getting smaller. This one fits snuggly into the palm of my hand not unlike the wooden balls you throw at a coconut shy – or as I remember, at the china-smashing stand at my first school’s fete. I’ve decided that, as this swede is not scarily huge, I reckon I should give it another go. Once more unto the breach, dear friends, once more . . . I haven’t done a box shot for while, but you’ll notice from this one that these days the cardboard veg boxes are a lot smaller and easier to re-use or recycle – yay! I’m not pleased to say that this week the mushrooms, the potatoes and the carrots have all arrived in plastic. BIG boooo! Plastic Packaging in a Veg Box . . . Why? • Carrots • Sweeeeeeede • Sweetcorn and • Mushrooms. Any swede that enters my home gets escorted next door as quickly as possible, so as much as I hate them, I love them for their role in neighbour relations! And joy! 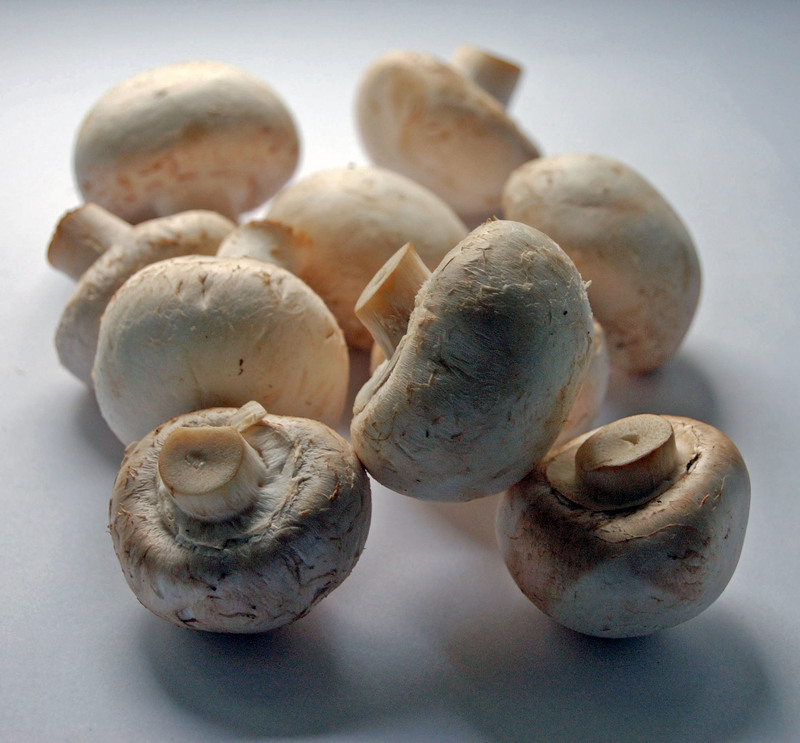 For the first time my box has produced a punnet of normal mushrooms. I look forward to introducing them to some cloves of garlic later in the week. However, I still can’t help cringing when any of my veggies arrive packaged in plastic. Not only were the mushrooms in a plastic punnet covered with cling film, but the potatoes have arrived in plastic bags for several weeks. The potatoes used to come in paper bags with no labels. My only guess is that these potatoes have travelled further and have had to be sealed and labelled to prove the origin of the contents, but I’m not convinced. I look forward to my veg box provider finding new solutions that don’t involve plastic bags, punnets and cling film. It doesn’t seem right for veg boxes to contain this sort of packaging. Swede . . . OOF! It’s got a face only a mother could love and it’s smell has a hint of fart about it. I know there are probably swede lovers out there, but I’m not one of them – could you tell? But . . . I made a pact that I wasn’t going to throw anything from my veg boxes away so it’s got to be eaten. My swede was larger than a baby’s head so there was no way I could eat it all at once. I started by cutting a third off and using it in a root veg gratin. It was kind of OK, but my least favourite veg gratin so far – and it didn’t convert me. With the bulk of the thing still left, I searched for some ideas online. The Abel & Cole website had a few interesting ideas and I plumped for a swede and apple bake, thinking the taste of the swede would be disguised. I mashed the swede and three apples with some butter and a pinch of nutmeg. This was then transferred to a dish for the oven and the top was covered in breadcrumbs and little knobs of butter. It smelled much more swedey than appley. Anyway, I chucked it in the oven at 170°C for about 20 minutes. I didn’t know what to serve this dish with so I ate it on it’s own. It’s not the kind of thing you can eat a lot of and it definitely needed something with it. I searched the internet again and found a few swede recipes with parmesan – that might be good to try the next time I get one of these carbuncles in my box. UPDATE: I ate the swede and apple bake some time ago and there’s still a strong taste of swede in my mouth. I hope my breathe doesn’t smell of swede, I told you what I thought they smell off . . .